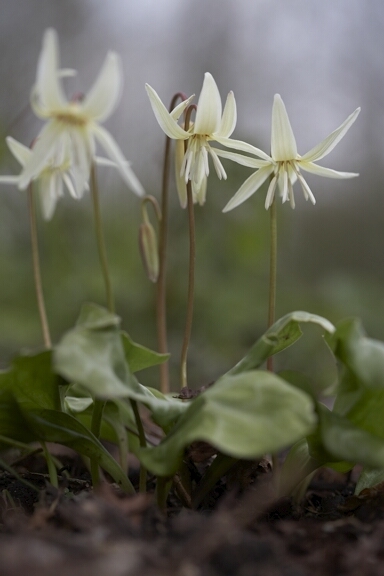 There are about 30 species of the woodland plant Erythronium, distributed throughout North America, Europe and Asia. 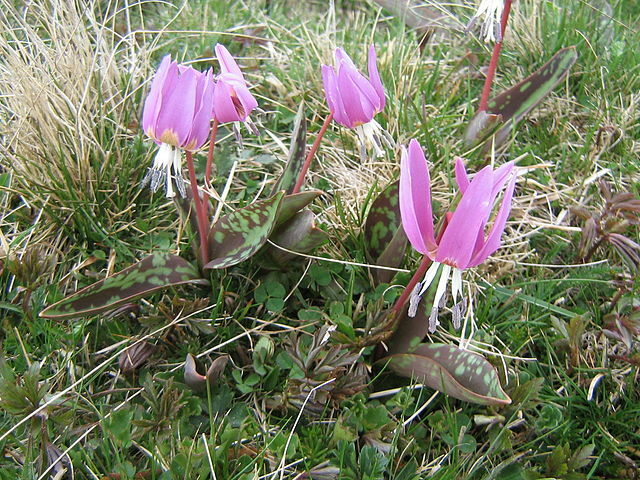 The common name of ‘dog’s tooth violet’ is a reference to the shape of the bulb. To grow them well you need the cool, humus rich conditions woodland conditions that they enjoy in the wild. If your garden is hot and dry, these are not for you. Mine grow amongst wood anemones and hellebores under a Japanese maple. They are slow to bulk up and you have to be patient to get to the drifts of flowers that a lot of gardening books talk about. The wonderful British plant nursery, Spinners, in Hampshire have large clumps of the plant but they have been fifty years in the making. Erythroniums growing at Spinners nursery. 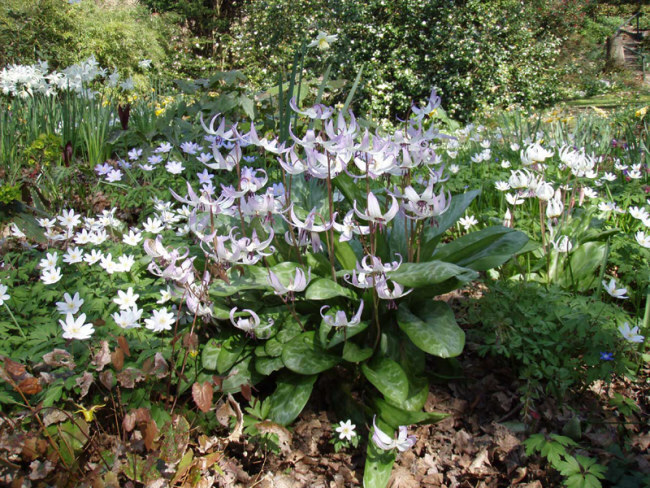 The most commonly seen and easiest to grow is this European species, Erythronium dens-canis which was recommended in early herbals as being both an aphrodisiac and a cure for worms in small children. The mottled leaved and reflexed, usually pink, flowers look good growing in short grass. It is a charming plant but has none of the allure of the North American forms. My own favourite, and one which is vigorous and floriferous, is Erythronium californicum ‘White Beauty’, which was named by the American nurseryman Carl Purdy at the beginning of the 20th century. For once, its cultivar name sums it up perfectly.